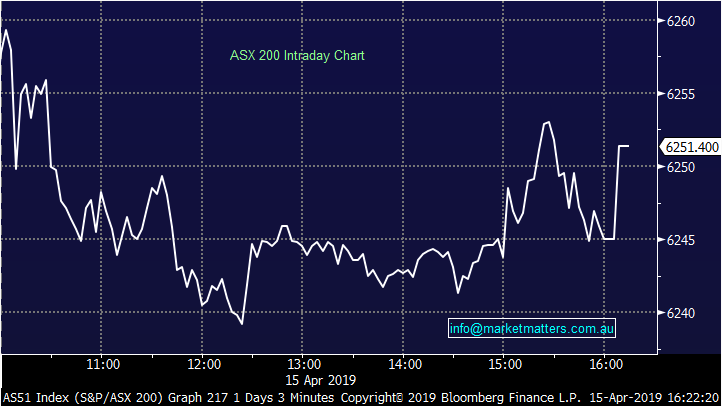 The ASX 200 was in two minds throughout the trading day, twice trading a small margin above par but ultimately failed to make any headway in either direction to close flat on the session. There was a noticeable lack of volume across much of the market today, contributing to the lack of movement today. Expect this to be a theme over the next fortnight with the two shortened trading weeks as a result of Easter and ANZAC day. We expect the campaign trail for the federal election as well as quarterly reporting season both in the US and for Australian miners and fund managers will be the focus of investors for now. We discuss two quarterly updates below. 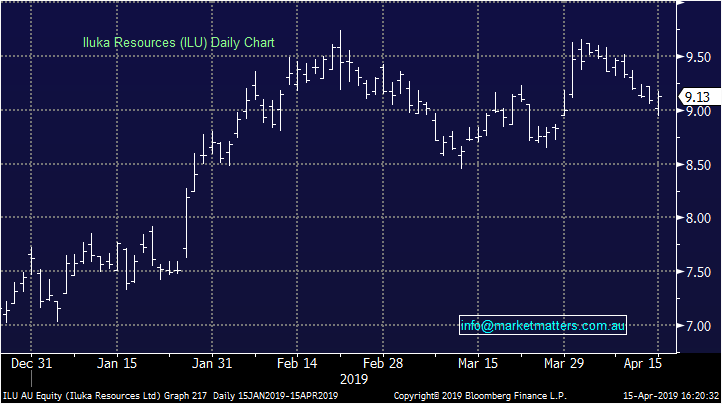 Banks continued the upward momentum seen on Friday, the energy names pushed higher on M&A activity in the US as well as an oil bounce and consumer staples also saw some broad based buying. On the other side of the ledger was the bond proxy utilities, while healthcare was dragged by sector heavyweight CSL. 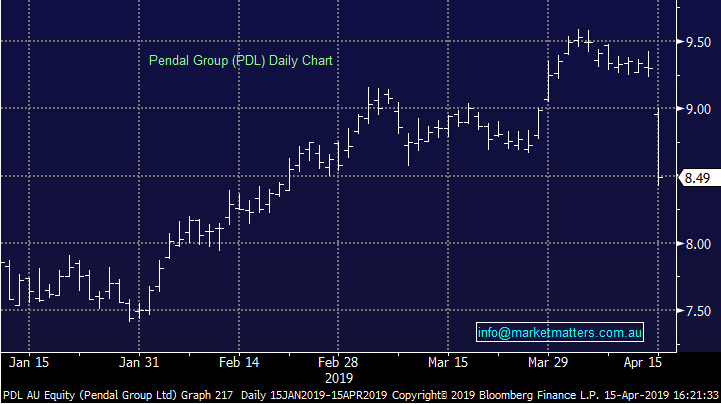 Pendal Group (PDL), -8.71%, continued the sell off from Friday, although with plenty more vigour today as is seemed the market seemed to catch on to some skeletons in closet from the FUM update the company released Friday morning. FUM might have seen a 9.5% uplift from the previous quarter, with the bulk of it driven by market performance (+$2.8b) and along with net flows of +$1.2b. the bulk of the flows however were into lower margin cash and fixed income products. 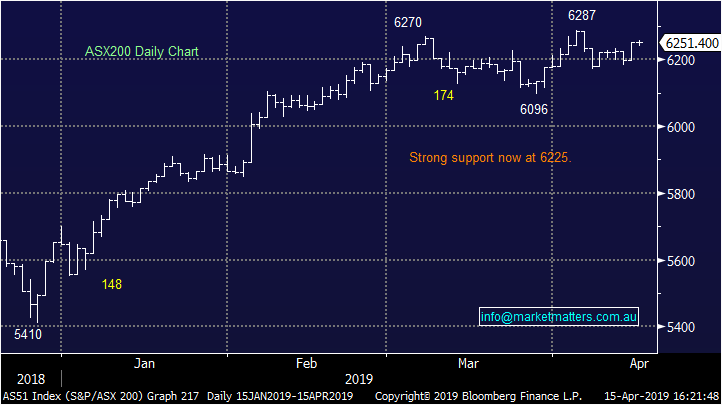 Pendal has had a good three months of performance on a stock level, rising over 20% to recent highs set early in April – it seems the market had priced in a lot of the recovery in FUM with the rising market and has now been disappointed with net flows. The old BT is also battling the changing financial advice landscape with a large portion of its FUM stemming from bank aligned advisors, particularly its affiliation with WBC helping drive flows into high margin products – Westpac are also likely to redeem a large chunk of funds when they come up for renewal this month. Not one we like at these levels.